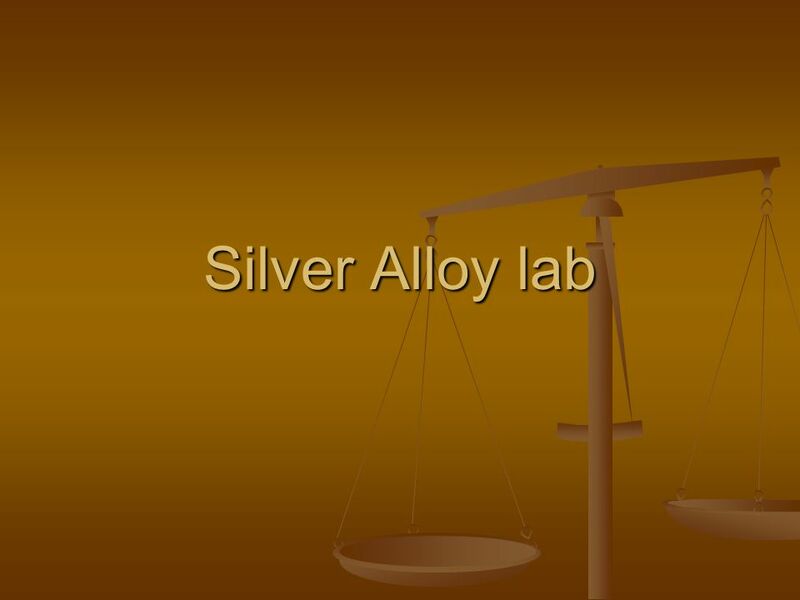 Silver Alloy lab. 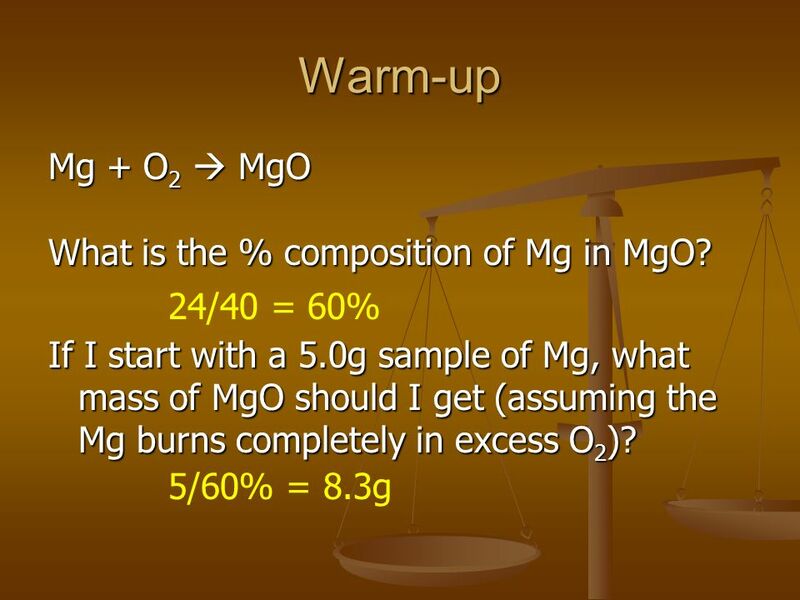 Warm-up Mg + O 2 MgO What is the % composition of Mg in MgO? If I start with a 5.0g sample of Mg, what mass of MgO should I get (assuming. 4 The chemistry involved Must oxidize (ionize by removing electrons) the Ag and other metal(s) into ions so they will dissolve in water. 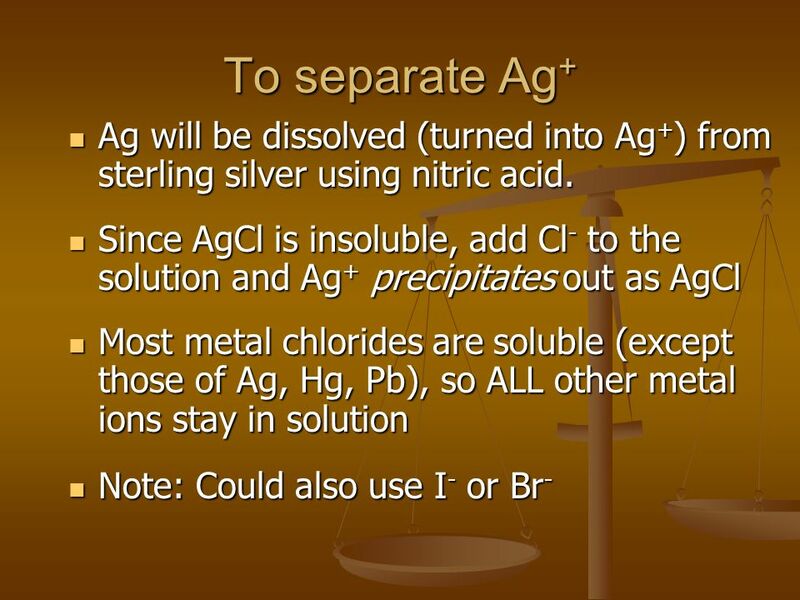 Must oxidize (ionize by removing electrons) the Ag and other metal(s) into ions so they will dissolve in water. 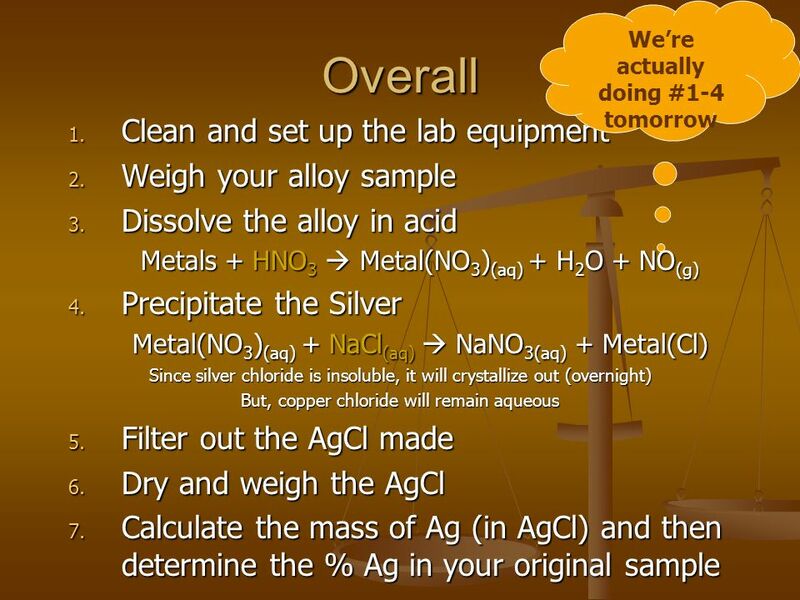 Normally acids are used to oxidize metals Normally acids are used to oxidize metals Normally acids are used to oxidize metals Normally acids are used to oxidize metals H + is only a fair oxidizing agent H + is only a fair oxidizing agent NO 3 - in acid solution is stronger NO 3 - in acid solution is stronger HNO 3 used to oxidize the alloy, get metal ions into solution. 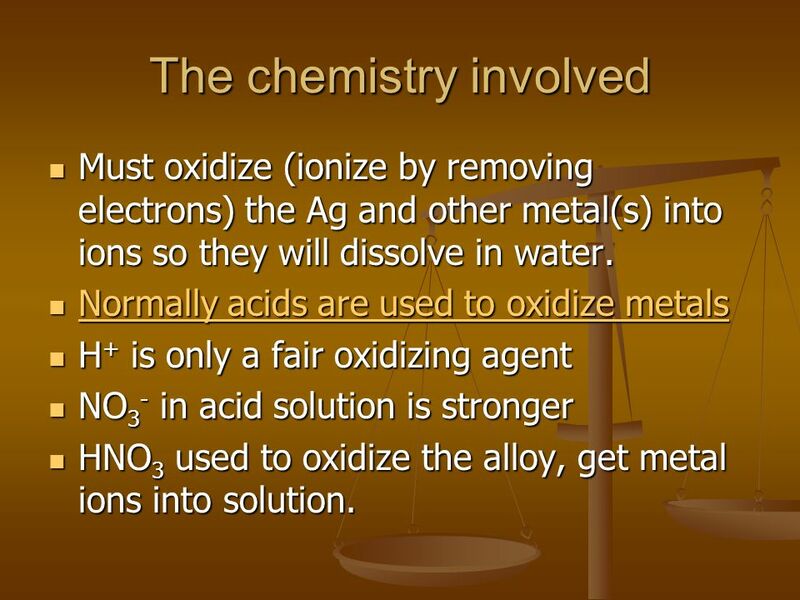 HNO 3 used to oxidize the alloy, get metal ions into solution. 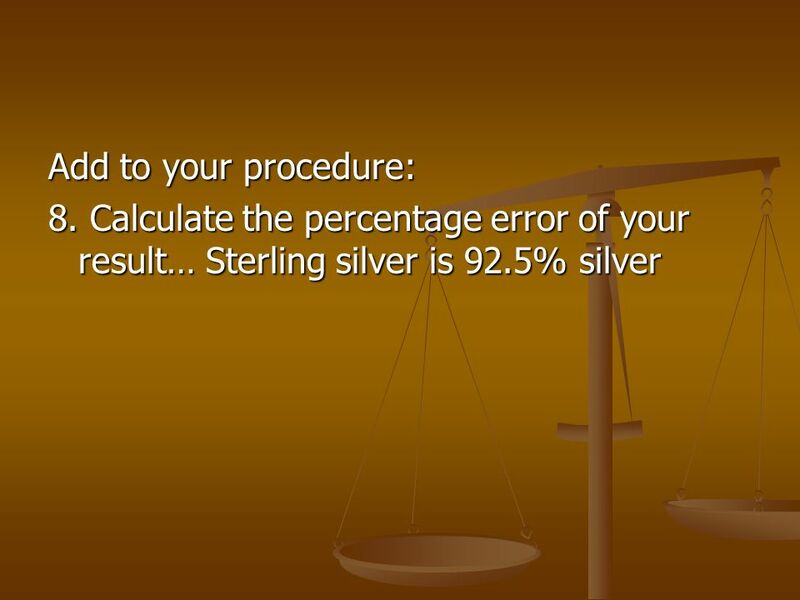 Download ppt "Silver Alloy lab. Warm-up Mg + O 2 MgO What is the % composition of Mg in MgO? 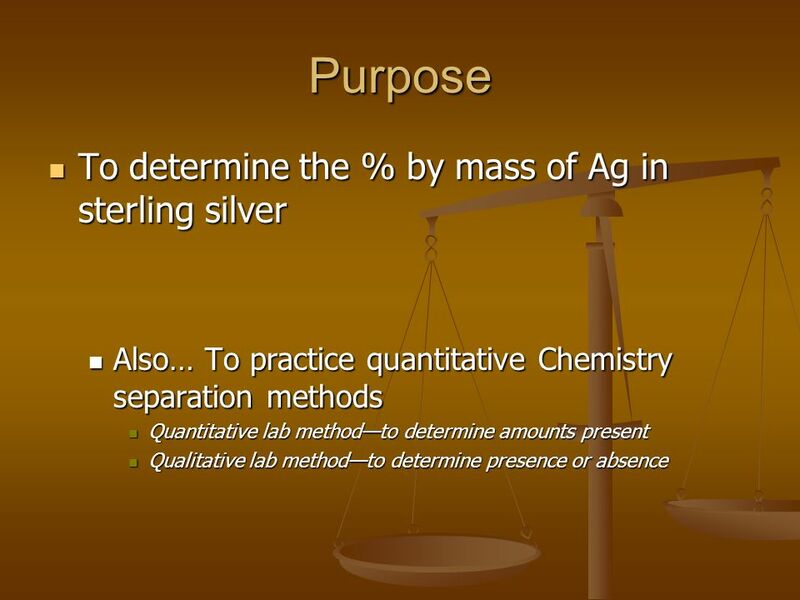 If I start with a 5.0g sample of Mg, what mass of MgO should I get (assuming." Dr. S. M. Condren Chapter 5 Reactions in Aqueous Solutions. The main tasks of Chap 8 Sect 1 - Writing reactions from word problems – challenging Sect 2 - Balance Equations—easiest Sect 3 - Classify Equations, Complete. Daniel L. Reger Scott R. Goode David W. Ball Chapter 4 Chemical Reactions in Solution. Chapter SixteenPrentice-Hall ©2002Slide 1 of 32 Solubility Products Heterogeneous Equilibria Slightly Soluble Salts. Precipitation Equilibria. Solubility Product Ionic compounds that we have learned are insoluble in water actually do dissolve a tiny amount. 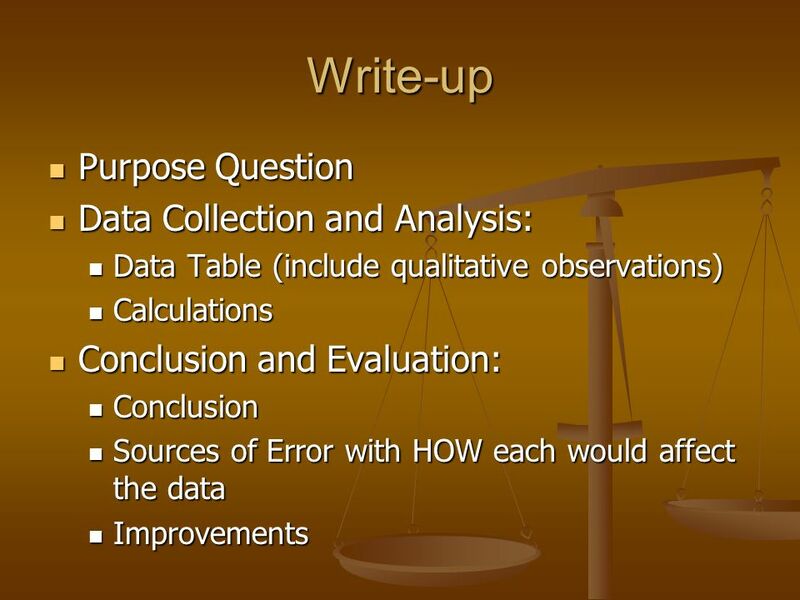 We can quantify. Reactions in Aqueous Solution Chapter 4. A solution is a homogenous mixture of 2 or more substances The solute is(are) the substance(s) present in the. VI.Applications of Solubility 1.Chloride Ion Titration The concentration of chloride ion in a water sample is determined. Adding Ag + to the water sample. Jonah Chevrier Nick Jiang Ushhud Khalid Philip Van-Lane. TESTING FOR CATIONS QUALITATIVE ANALYSIS. Reactions in Aqueous Solutions  a.k.a. Net Ionic Equations  Molecular Equations : shows complete formulas for reactants and products –Does not show what. SCH 3U1 1. Solubility of Ionic Compounds 2 All solutes will have some solubility in water. “Insoluble” substances simply have extremely low solubility. Aneeqa Haider, Ariel Tsang, Carrie Fan, Fabiha Nuzhat. PRECIPITATION REACTIONS Chapter 19 Copyright © 1999 by Harcourt Brace & Company All rights reserved. Requests for permission to make copies of any part. 1 Solution Stoichiometry The concentration of a solution is the amount of solute present in a given quantity of solvent or solution. M = molarity = moles. 1965 to date Clad Coinage Composition: 75% copper, 25% nickel Weight: 2.27g Diameter: 17.9mm Edge: Reeded A.P. Chemistry. 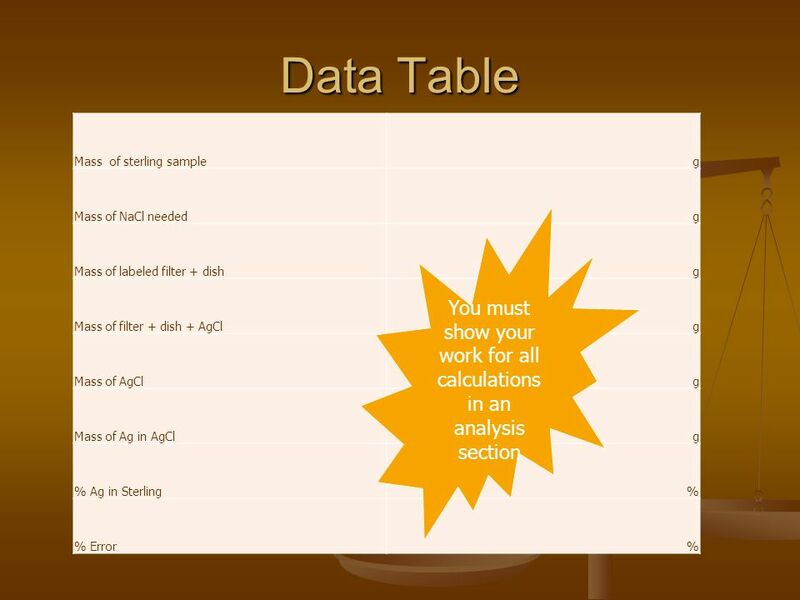 Gravimetric Analysis using PPT.